Research, tenacious advocates and $16 billion have lifted Columbia salmon from the brink of extinction. FRIDAY HARBOR, WASH. -- Just one of the three pods of endangered southern resident killer whales has shown up this year in the Salish Sea near the San Juan Islands northwest of Seattle, their summer home as long as researchers have followed them since 1976. Deborah Giles, research director of the Center for Whale Research, said she isn't concerned yet for the other two pods of fish-eating orcas. But she worries about what the next decade holds for the beloved sea mammals that share the Puget Sound with millions of people, thousands of boats and just a fraction of the salmon that historically were the orcas' main food source. If humans don't make saving orcas and salmon a higher priority, she fears both will disappear. With just 80 individual orcas left, the southern resident population has the least amount of time. One of the most important food sources is spring chinook salmon from the Columbia River. Orcas use the mouth of the Columbia as a winter "buffet," stopping on their annual migration from their home in the Salish Sea south to Monterey, Calif., and north to southeast Alaska. "Every time they go by the Columbia, they stop and they forage for days and days and days on end," Giles said. "They don't behave like that in any (other) single location across their range." The decline of the orcas coincides with the drop in salmon numbers. Historically, two rivers were critical -- the Columbia and the Fraser in Canada, where the salmon that the whales eat in the summer come from. A study by the Center for Whale Research and the Center for Conservation Biology at the University of Washington, along with partners at NOAA's Northwest Fisheries Science Center, suggested that up to two-thirds of pregnancies failed in the southern resident killer whale population from 2007 to 2014. The study links the low reproductive success to "nutritional stress." "We believe that a low abundance of salmon is the primary factor for low reproductive success among southern resident killer whales," said lead author Sam Wasser, a UW professor of biology and director of the Center for Conservation Biology. "During years of low salmon abundance, we see hormonal signs that nutritional stress is setting in and more pregnancies fail, and this trend has become increasingly common in recent years." The Snake River has always been the Columbia River's most productive source of salmon, and that's why Giles and the Center for Whale Research have become among the strongest voices for returning the Snake to more natural migrating conditions by breaching four dams in Washington state. "We feel like it's the best bet the whales have," Giles said. Other scientists have recommended the four dams' removal as the best of a set of options to restore four species of salmon and steelhead that spawn above the dams to healthy populations. Political leaders and federal dam agencies have resisted, and the future of the dams will be one of the focuses of a new federal management plan ordered by a federal judge. Removing the four Snake River dams would still leave four hydroelectric dams on the Columbia as obstacles for the wild salmon that spawn in the high-altitude wilderness in Central Idaho. Advocates argue that removing the four Snake River dams is a good option because they produce most of their power in the spring when it's not as critical to Northwest power supplies, and that breaching them would be relatively simple and inexpensive. "Salmon are some of the most amazing creatures ever to evolve on this planet," said Giles, who holds a Ph.D. from the University of California-Davis. The three pods of the southern resident killer whales aren't the only orcas that live in the Salish Sea, the two-nation ecosystem that includes the Puget Sound, the Strait of Juan de Fuca, the San Juan Islands, and British Columbia's Gulf Islands and the Strait of Georgia. 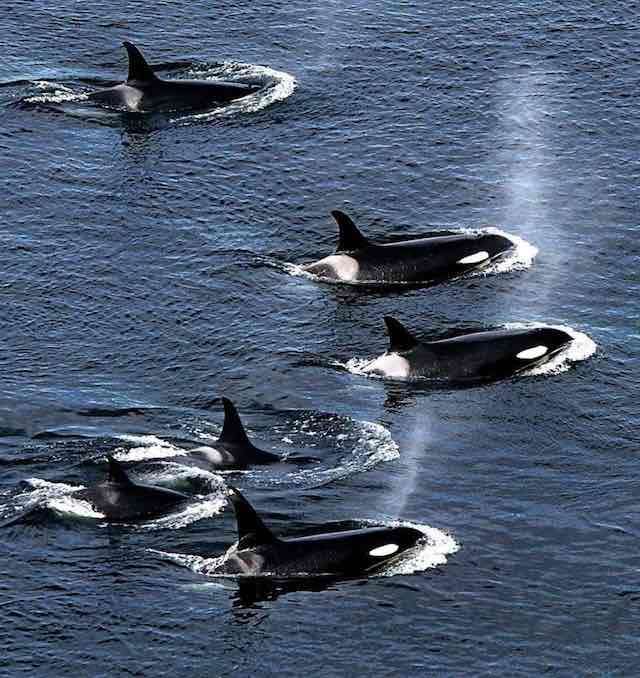 The northern resident killer whales, whose range overlaps with the southern residents, number about 300 and live mostly north of Vancouver Island's Campbell River. The two populations don't interbreed and don't even communicate with the same dialect, Giles said. Other transient orcas, which eat marine mammals such as stellar sea lions and seals, also migrate through the Salish Sea. National Oceanic and Atmospheric Administration scientists agree that the Columbia's chinook are a critical food source for orcas, but not the only one. Along the Pacific Coast, 28 separate stocks of salmon are listed as threatened or endangered under the Endangered Species Act, a reflection of the human development that has dried up rivers, contaminated them with pollutants and filled traditional river floodplains with homes, businesses and factories. When it comes to whether removing the Snake River dams is the best way to help orcas, Lynne Barre, NOAA Protected Resources Division branch chief, defers to the agency's fisheries staff, which works on recovering threatened and endangered salmon from California to the Puget Sound. Ritchie Graves, a NOAA Fisheries biologist working on the current review of dams on the Columbia, said it's too early to determine whether removing the dams is necessary. But scientists know the Columbia River's fish are a significant factor in the fate of the orca, Barre acknowledged. "Some of the Columbia River salmon runs are very abundant. They are creating a large run of chinook salmon for the whales," Barre said. The southern resident killer whale population was listed as endangered in 2005. Its recovery plan says the whale's limiting factors include lack of food prey, high levels of contaminants, and disturbances from boats and noise. NOAA designated 2,500 square miles of the Salish Sea as critical habitat, where federal agencies can't take an action -- such as building a new shipping port -- that would hurt the orcas or their habitat. NOAA is now reviewing a petition proposing to extend what it considers critical coastal habitat for the orcas from Monterey to southeast Alaska. "The number observed was about double what we would have expected," Hanson said. "If we shifted that to a nonhuman, species-centric fisheries recovery plan, we could do something about wild gene pools," Giles said. "Really, what it boils down to is that our fisheries worldwide are managed for human consumption," she said. "Fish are not being restored for the fish's sake." "The fact is we humans have a choice in what we eat for protein. Southern killer whales don't," Giles said. Columbia salmon advocates and orca supporters have teamed up to form the Orca Salmon Alliance. But you won't hear the Save Our Wild Salmon Coalition, which is part of the alliance, go as far as Giles in calling for hatchery closures and a fishing moratorium. "What we do agree on is the sense of great urgency to deliver help to orca and for salmon today, and the need for significantly larger and more diverse populations of wild salmon for orca and people -- and the freshwater and saltwater ecosystems of the Pacific Northwest," said Joseph Bogaard, Save Our Wild Salmon Coalition executive director. The appeal of the orca brings urban Washington and British Columbia residents who live on the Salish Sea into the Columbia Basin salmon debate. That could be critical, because none of Washington's relatively green political leadership has backed breaching the four Snake River dams in the state's northeast corner. "They are a charismatic species that we all want to protect and preserve," Flores said. "I'm sure Save Our Wild Salmon cares about the orcas, but they also use them to play on the public's sympathies to promote their real goal: removal of the Snake River dams. "I think it's a stretch to connect the orca situation with the Snake River dams." Fate of Pacific Northwest Orcas Tied to Having Enough Columbia River Salmon <-- Watch Video at original site.